One of the most affluent neighborhoods in the city, Pacific Heights is chock full of billionaire residents, picturesque Victorian homes and sweeping views of the Golden Gate Bridge, Presidio and downtown San Francisco. 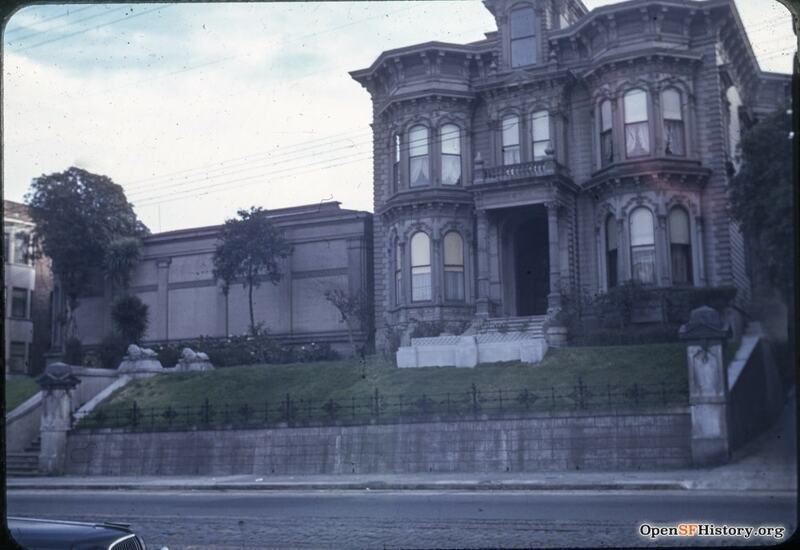 Here you’ll find historically rich homes such as Spreckels Mansion and the Haas-Lilienthal House. In 2013, Pacific Heights was named the most expensive US zip code by Forbes. 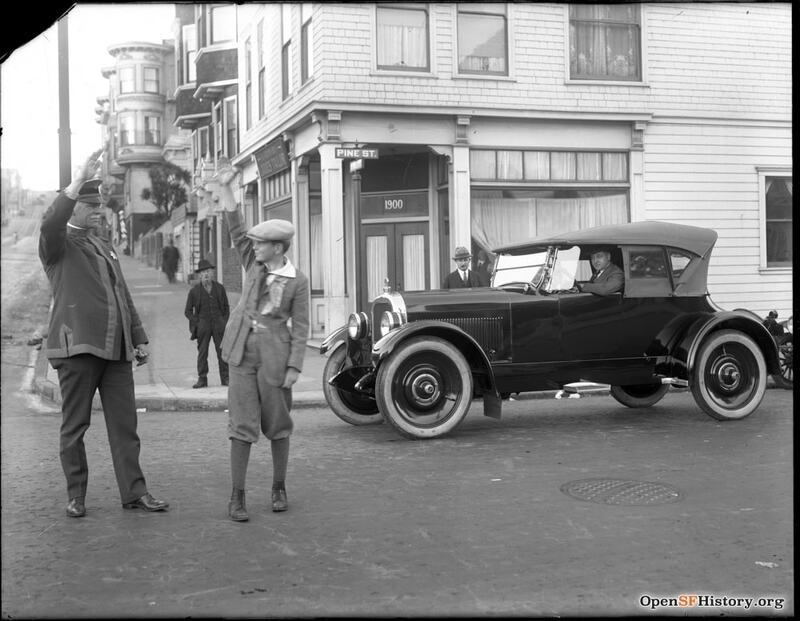 Take a dive into the ritzy neighborhood’s past via our photo series below. 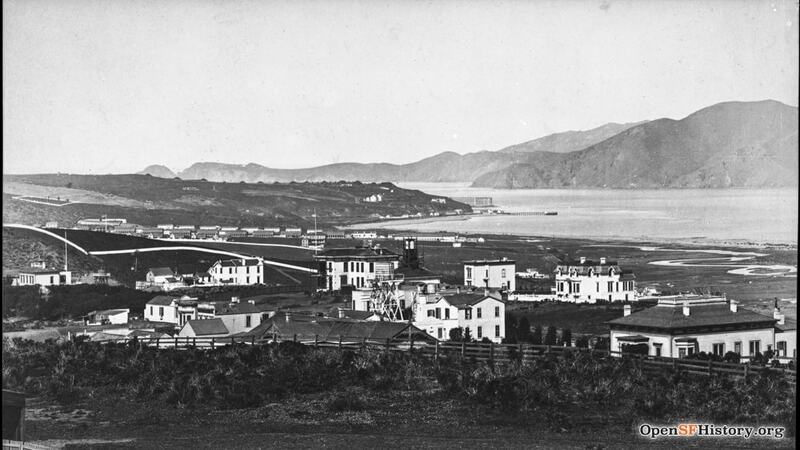 First developed in the 1870s by wealthy residents, Pacific Heights was originally just a gathering of small Victorians intended to be more impressive than nearby Nob Hill. 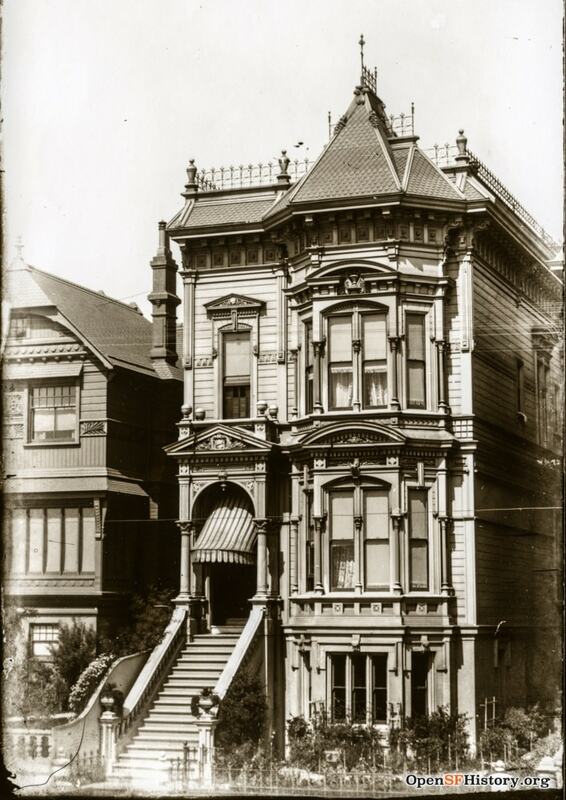 Italianate architecture, often considered a reinterpretation of Classical architecture, became one of the most popular 19th-century styles in San Francisco. The term “Victorian” simply means that the residence was built during Queen Victoria’s reign (1837-1901). 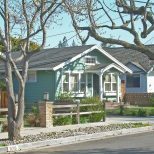 Due to the 1906 earthquake and certain elements of Victorian architecture not reaching the US until after her death, we still consider many homes “Victorian” even though they were constructed afterward. 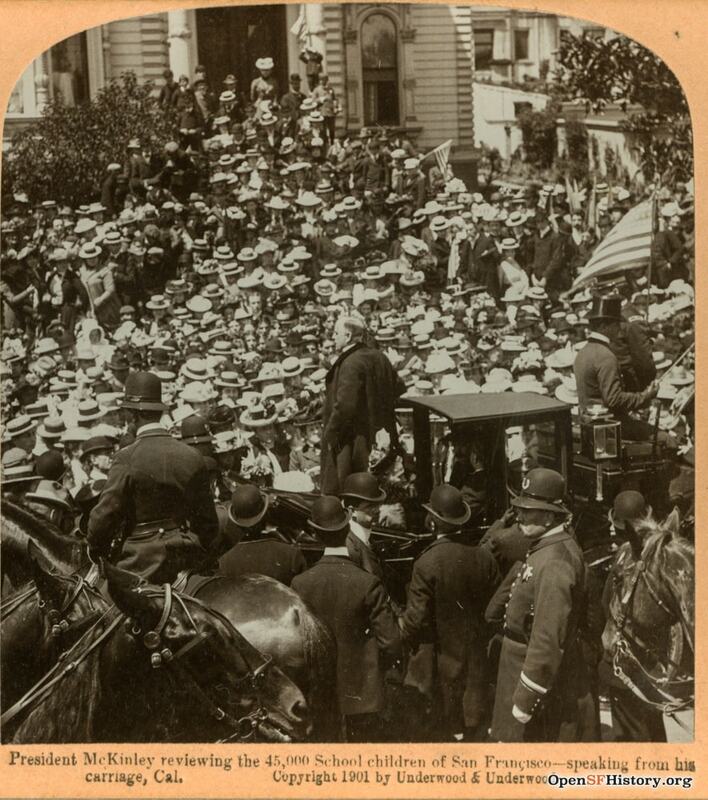 Months before his assassination, here President McKinley is speaking to 45,000 school children while visiting San Francisco. While the earthquake itself was calamitous, the fires that were ignited destroyed 80 percent of the city and killed 3,000 people. With water lines ruptured, there was little firefighters could do to save the city’s mostly wooden buildings. Even during the most dour of times, it’s good to maintain a sense of humor. 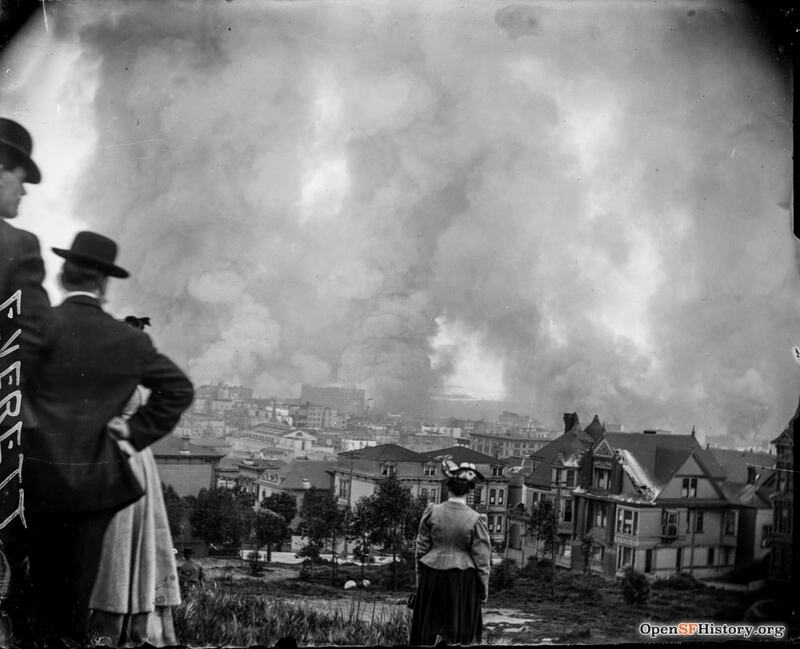 The property losses from the earthquake and subsequent fires amounted to nearly $400 million in 1906, which would be equivalent to $10.7 billion in 2016. 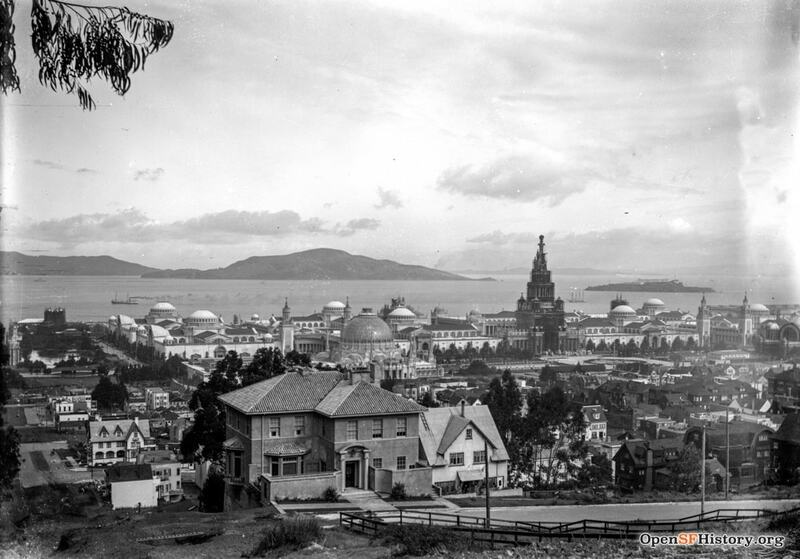 The Tower of Jewels, seen off in the distance as the tallest building in this photo, was the focal point of the Panama-Pacific International Exposition in 1915. The temporary structure was 435 feet tall and covered in more than 100,000 glass faceted “jewels” that glittered spectacularly in the sunlight. 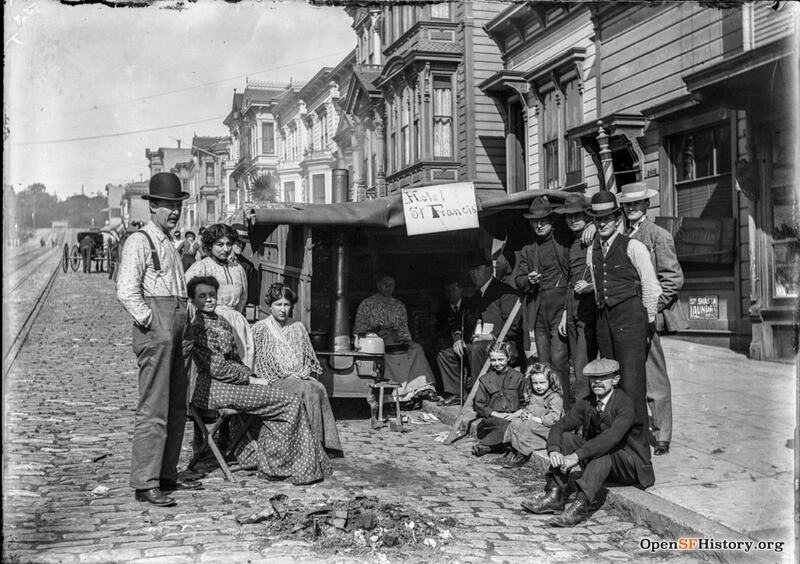 This was a time for the city to celebrate its rebirth and reconstruction after the 1906 earthquake. 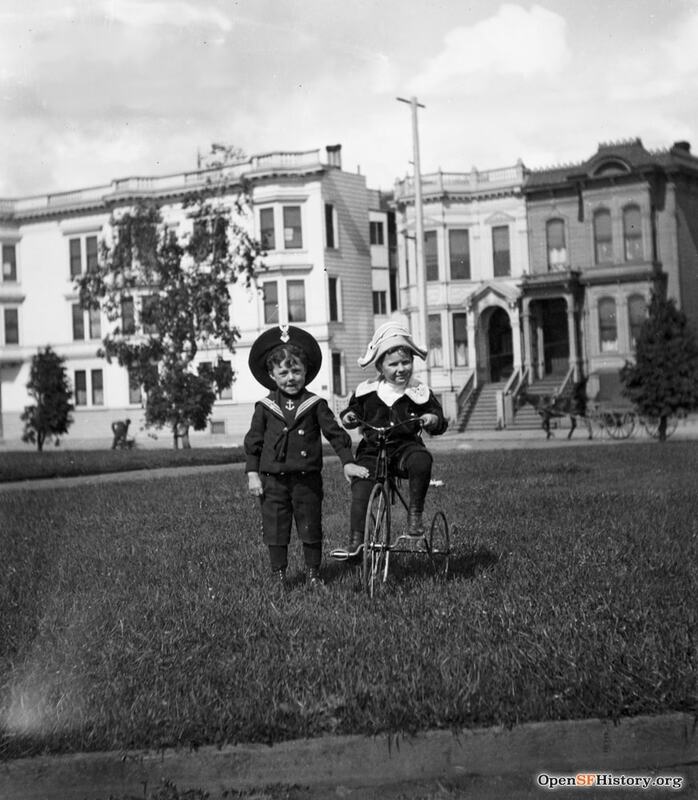 This was a productive time for the city when it developed important infrastructure, such as the Twin Peaks Reservoir, the Stockton Street Tunnel, the streetcar (MUNI) system and the Hetch Hetchy Reservoir. Michael H. de Young co-founded the Daily Dramatic Chronicle newspaper in 1865 with his brother, the predecessor of the now critically acclaimed San Francisco Chronicle. The de Young Fine Arts Museum was named in his honor after he donated $200,000 for its establishment. 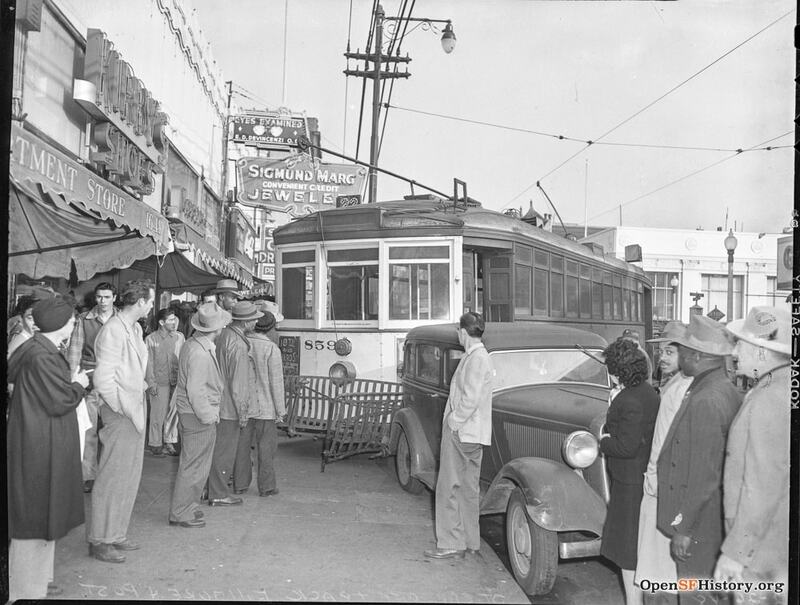 Not the best parallel parker, here a streetcar is seen hanging off a curb following an accident on Fillmore and Post. 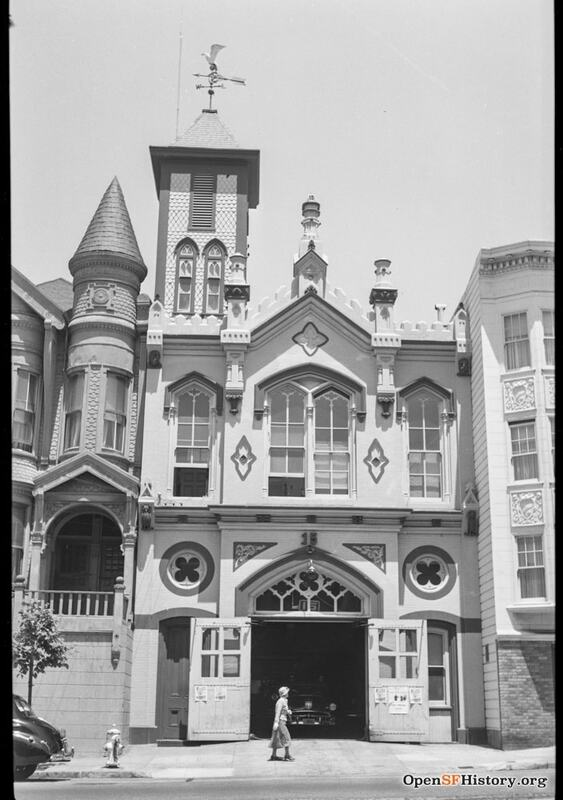 Up until 1972, fire stations were known as firehouses in San Francisco. Unfortunately, this incredibly unique firehouse (formerly at 2150 California Street) has since been demolished and turned into a much less decorative fire station. 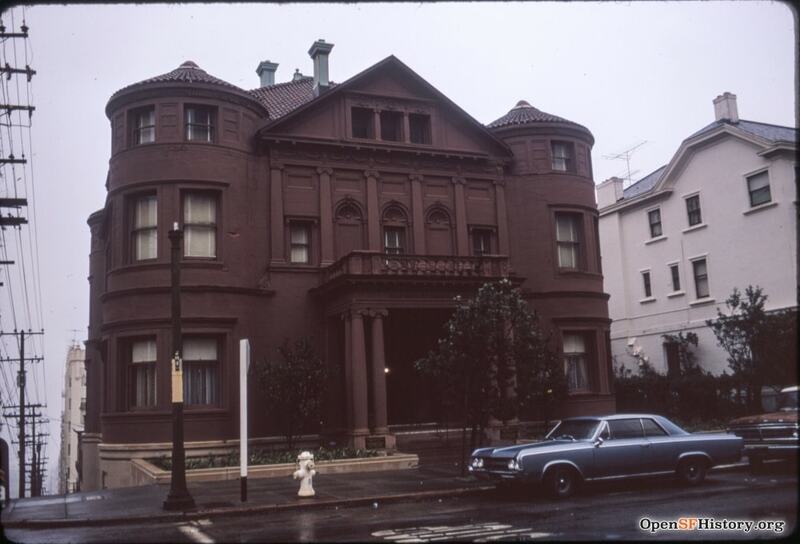 The Spreckels Mansion at 2080 Washington Street was designed by George Applegarth as a French Baroque-style chateau for sugar magnate Adolph B. Spreckels and his wife, Alma. When Adolph B. Spreckels was 27, he shot the previously mentioned Michael H. de Young, but was acquitted after pleading temporary insanity. 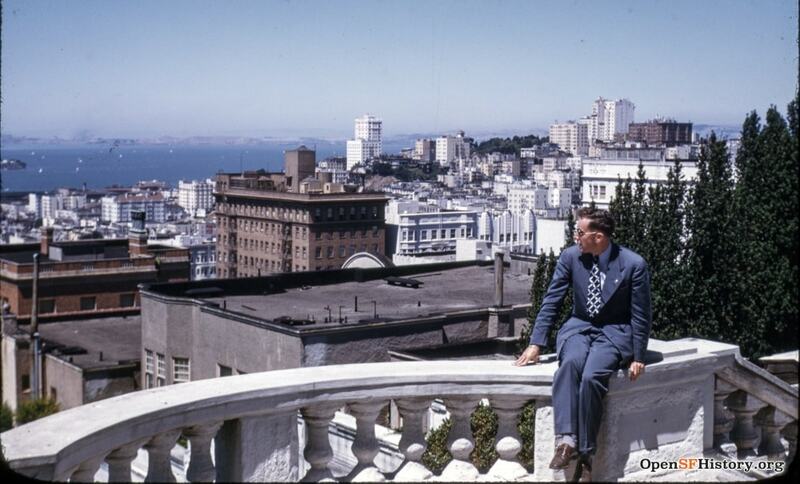 He also donated the California Palace of the Legion of Honor during his last year of life. Today, the famous romance novelist Danielle Steel resides in Spreckels Mansion. 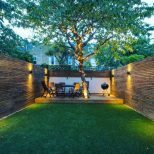 This 30-room masterpiece at 2090 Jackson Street was constructed with steel-reinforced brick walls and a facing of Arizona red sandstone. 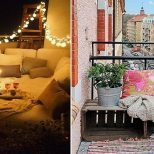 It’s rumored to be haunted and is listed on the National Register of Historic Places. 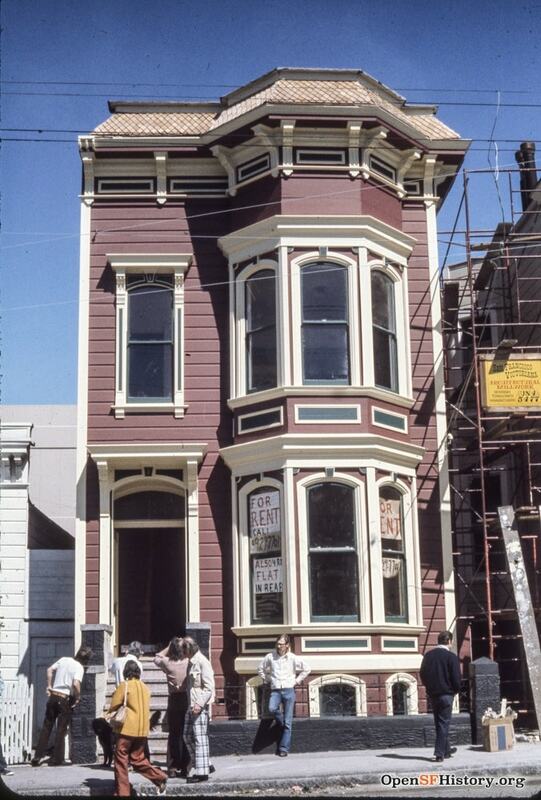 Though it’s now painted white and includes a garage, 2250 Bush Street still stands strong 44 years later. The single-family home was built in 1880 and last sold for $1.8 million in October 2011, according to Zillow.